Item: Just how long does it take for a team to open up a football game with a 7-0 lead? Since the amazing play occurred 10 seconds into the famous 1987 Penn State game in the Dome (SU is celebrating the 30th anniversary of that season this year), the first play from scrimmage 80 yard scoring pass from Don McPherson to Rob Moore, we had never seen a college football game with a team leading 7-0 with more than 14:50 on the first quarter game clock. Coach Mac had a point. We remember a Jim Turner 100 yard kickoff return TD to begin the Pitt game in the Dome in 1996, tied with four others for the longest kickoff return by an Orange player, but even that took 11 seconds making it 7-0 Syracuse with 14:49 on the clock, as SU went on to rout the Panthers 55-7. That all changed in now our 43rd season of observing and covering SU football in last week’s LSU game. 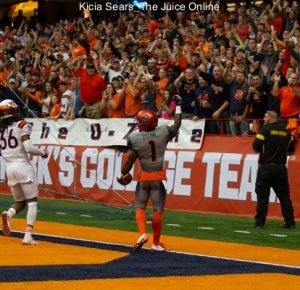 The Tigers scored just nine seconds into the game, making it 7-0 with 14:51 on the game clock, and if it were not for Eric Dungey drilling (and also grabbing some facemask) LSU cornerback Greedy Williams out at the one yard line following his interception of a Dungey pass on the first play from scrimmage, it would have been 7-0 just six seconds into the game with 14:54 on the clock, a mark that would be hard to break in any college game. 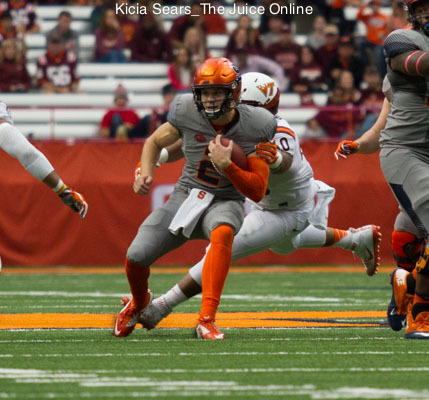 » Related: Do moral victories mean anything for Syracuse football? One play after the Dungey pick, Tigers running back Derrius Guice leaped into the end zone untouched from the one yard line, and following the PAT it was 7-0 LSU at the 14:51 mark of the first quarter of its eventual 35-26 win over the ‘Cuse. As is, it’s hard to score a touchdown just nine seconds into a game, or the start of the second half for that matter, as evidenced by the 15 seconds it took for LSU to score on the 87 yard pass play from Danny Etling to Drake Davis on the first play from scrimmage of the third quarter. 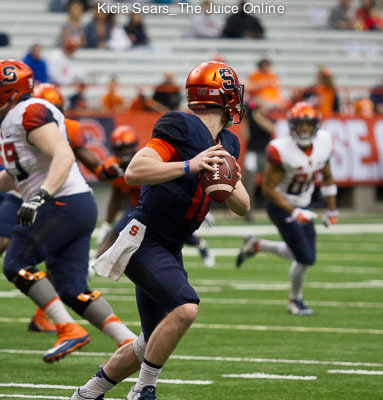 When the NCAA moved kickoffs to the 35 yard line in 2012, it also moved up touchbacks on the kickoffs to the 25 yard line from the 20, in theory making it easier to score faster on a 75 yard pass play, as opposed to the previous 80 yards as in the ’87 SU-Penn State game. But for all intents and purposes, there are only a few ways to score a touchdown in under 10 seconds. One is to have a touchback on the opening kickoff with the clock not starting before the first play from scrimmage. The other is some sort of miscue on the kickoff such as a fumble by the receiving team, or a botched opening onside kick by the kicking team resulting in a player scooping up the ball and sprinting half the field or so. Even the fastest kickoff return players, as evidenced by the speedy Turner in the ’96 Pitt game, have to dodge obstacles on route to running some 100 yards, so it’s hard to do that in 10 seconds or less. By-the-way, what’s the fastest touchdown in an NFL game? Officially, its three seconds – 14:57 on the game clock. Randal Williams of the Dallas Cowboys leaped up and grabbed an attempted opening onside kick by the Philadelphia Eagles in a 2003 game running 37 yards for a touchdown. However, if you watch the replay, the clock operator at old Texas Stadium delayed starting the game clock by almost three seconds, perhaps confused by the action on the field, so while it was under 10 seconds, it was more likely six seconds, still pretty fast.